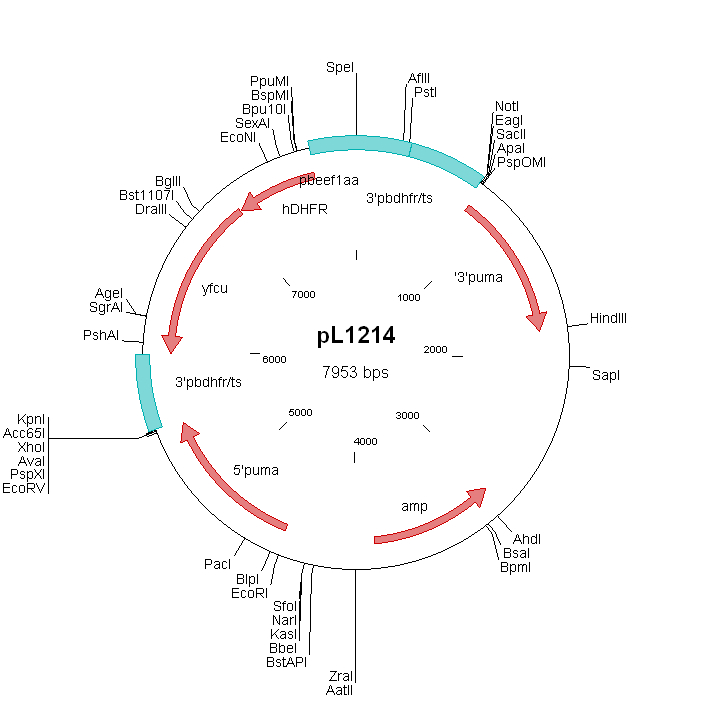 Other information parent line RMgm-7 is a P.berghei ANKA line (507cl1) which expresses GFP under control of a constitutive promoter (PubMed: PMID: 16242190). Fertilization and ookinete Normal numbers of gametocytes and ookinetes are produced (see also 'Additional remarks phenotype'). The mutant lacks expression of both the RNA binding proteins Puf1 and Puf2 and expresses GFP under under the constitutive eef1α promoter. The puf2 gene has been disrupted in mutant RMgm-514 which lacks expression of Puf1 and expresses GFP under the constitutive eef1α promoter. The drug-selectable marker hdfr/yfcu has been removed from this mutant by negative selection. This mutant that lacks expression of both Puf1 and Puf2 shows the same phenotype as mutants RMgm-515 and RMgm-516 that lack only expression of Puf2. 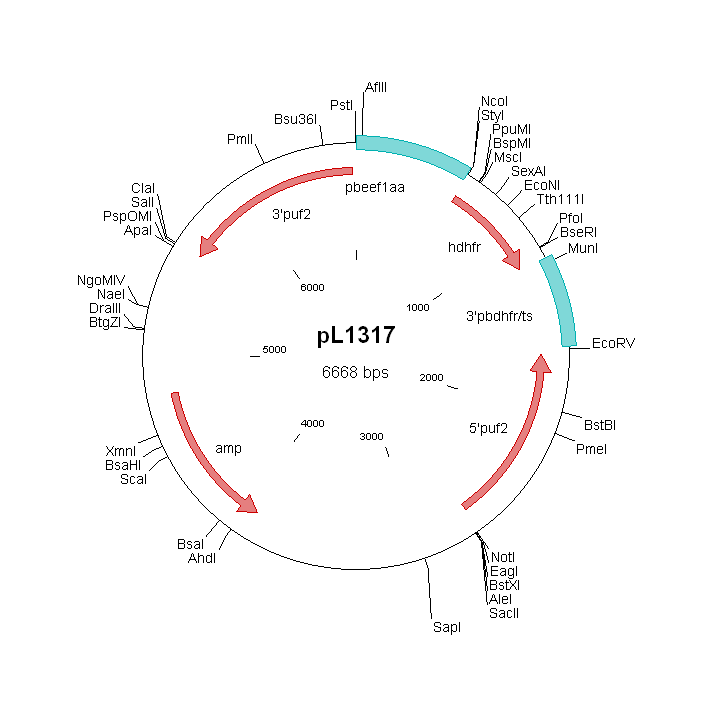 The phenotype analyses of mutants RMgm-513 and RMgm-514 that lack only expression of Puf1 indicate that Puf1 is not essential for blood stage development, production of gametocytes, ookinetes, oocysts and infective sporozoites and for mosquito transmission and liver stage development (see also 'Additional information'). The phenotype analyses of mutants lacking expression of puf2 indicate that Puf2 is not essential for blood stage development, production of gametocytes, ookinetes, oocysts and sporozoites. However, sporozoite gliding motility, cell traversal capacity and infectivity is affected. Evidence is presented that sporozoites in the absence of Puf2 'prematurely' initiate development into the early livers stage (EEF's) inside salivary glands (see below). The phenotype analyses indicate that the RNA binding protein Puf2 regulates the transition of sporozoites into liver stage forms. Mutant ookinetes showed a slightly different morphology at the light-microscope level (more 'stumpy and rounder' forms compared to the banana-shaped wild type ookinetes). The morphology of mutant ookinetes have not been analysed in more detail. This morphology of ookinetes resembles the morphology of ookinetes of mutants RMgm-513 and RMgm-514 that lack only expression of Puf1. Additional remarks genetic modification The puf2 gene has been disrupted in mutant RMgm-514 which lacks expression of Puf1 and expresses GFP under the constitutive eef1α promoter. The drug-selectable marker hdfr/yfcu has been removed from this mutant by negative selection. The puf2 gene has been disrupted in mutant RMgm-514 which lacks expression of Puf1 and expresses GFP under the constitutive eef1α promoter. The drug-selectable marker hdfr/yfcu has been removed from this mutant by negative selection.